With 70 million mobile phones in the UK, it's news that will make us all think twice about how much we use them. This week, research concluded that just half an hour spent on your mobile every day could raise your risk of developing brain cancer by as much as 40 per cent. the £15 million, decade-long study was carried out on more than 5,000 men and women with brain tumours from 13 different countries, as well as a similar number of healthy people, all of whom were interviewed about their phone habits. The researchers - scientists from around the globe who worked together for the World Health Organisation's interphone report - found increased risks among those who used their phones the most. The frequent users were also more likely to suffer a tumour on the same side of their brain to the ear they used for phone calls. More worrying still, a separate study by an American environmental lobby group put the risk 25 per cent higher, while warning of a 'brain tumour pandemic' in years to come. Yet, confusingly, UK cancer charities dismissed the group's claims as ' overblown', saying national brain cancer rates had not increased in proportion to 'skyrocketing' phone use. Scientists fear it could be another decade before we learn who's right. in the meantime, sales of mobile phones continue to soar, with an estimated 40 million people now fullyfledged mobile users, some of them children as young as five. 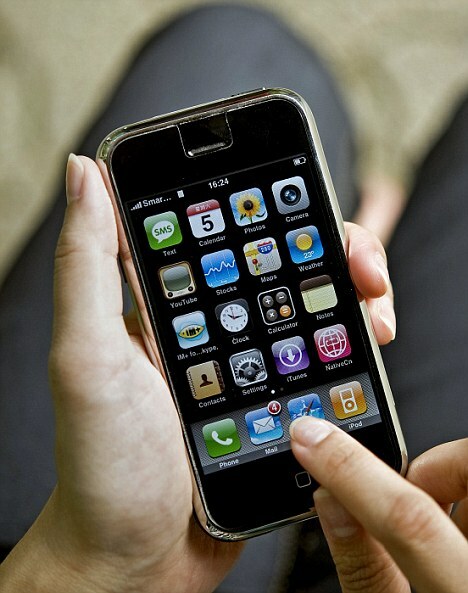 At the heart of the issue are the levels of radio waves that mobile phones emit, also known as radio frequency or RF. These are stronger than an FM radio signal but just one-billionth the intensity of an X-ray, which are known on occasion to cause cancer. These levels are recorded as a SAR level, which stands for Specific Absorption Rate, which is the maximum recorded rate at which your body absorbs radio waves per mass of body tissue (watts per kilogram). Governments around the world have drawn-up safety guidelines on recommended safe levels of mobile phone SAR levels to which manufacturers have to comply. in the U.S., this maximum level is 1.6 w/kg, while the European standard is slightly higher at 2 w/kg. Even the 2 w/kg limit is controversial. Two years ago, researchers at the University of Vienna, concerned that the modern generation of 3G smartphones were being launched without sufficient safety tests, revealed that brain cell damage started to occur well below the 2 w/kg level. These phones transmit continuously, not in pulses, so you are more exposed. Amid all this confusion, what can worried consumers do to minimise the risks? in America, San Francisco has become the first city to demand that shops selling mobile phones clearly display levels of radiation. But in Britain, the SAR rate of a phone is often hard to determine among the reams of information and instruction manuals that come with the handset. 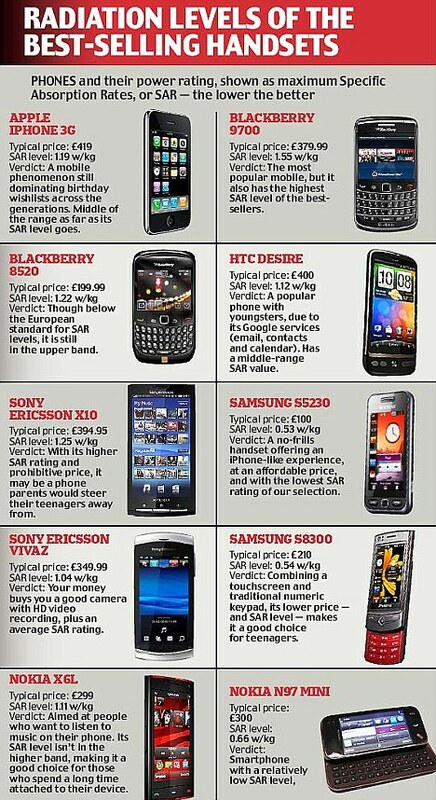 Here, we present a safety rating of Britain's best-selling mobile phones - and answer the questions every mobile phone user should be asking. What is it about mobile phones that makes them a health risk? Everything from rashes and nausea to thyroid damage and cancer have been blamed on mobile phones. While the evidence for this is controversial, the potential root cause is damage to the body's cells, caused by vibrating signals emitted by mobiles, says biologist Dr Andrew Goldsworthy of imperial College London. 'Cell membranes in the body are electrically charged and the pulsed radio waves used by mobiles make them vibrate, dislodging the calcium that binds the cells together. this makes them more permeable and releases enzymes that can damage the DNA in genes, including those that protect against cancer,' he says. This means the cells are more susceptible to damage. Indeed, a study two years ago by scientists at the University of Lund in Sweden showed that brain cells begin to die after two hours of phone use. Concern about these potential risks led to the Austrian insurance company, AUVA, bringing out a report last year warning that mobile radiowaves can cause irreversible damage to DNA. Can you tell if you are being affected? While some people claim to be electro-sensitive and immediately get minor symptoms, such as dizziness, muscle pains and nausea, even very heavy users often don't get symptoms, says Goldsworthy. 'It can take 20 years for diseases caused by progressive cellular damage such as cancer to develop,' he says. Does a headset reduce harmful effects? A headset puts more distance between the source of radiation in the handset and your brain, but it depends which type you use and how you use it, says Alasdair Philips, of consumer protection group Powerwatch. He explains that Bluetooth headsets, which work wirelessly, emit radiation continuously, so if you keep one on between calls you are exposed to continual radio frequency radiation. Are children more vulnerable to mobile radiation? Yes, for two reasons, says Dr Lennart Hardell, an epidemiologist and cancer specialist at Orebro University Hospital in Sweden. First, they have thinner skulls so absorb radio waves more quickly, and with smaller brains the absorption is more concentrated. Second, the cells throughout their body are dividing much more quickly than in adults and are very susceptible to damage. In a recent study, Dr Hardell found that while mobile use was linked to a threefold increase in brain tumour risk among adults, in children and teenagers the increase was five-fold. 'The outlook for children is much more serious because, as well as being more biologically susceptible to brain damage, they will be exposed to the risks for far longer than today's adults,' says Hardell. Research has also found that mobiles affect unborn babies because the radio waves can cross the placenta. Babies in slings are also in the line of fire from the radiation produced when a mother uses a mobile phone. Does it matter where you are phoning from? Yes, because the signal strength is determined by your location. The further you are from a phone mast, the more power the phone has to use to pick up a signal. In areas where it is weak, such as in the country, your phone will have to emit more power to pick up a signal. There is a similar effect in office blocks, but walking to the window can reduce the power needed to get a signal and, therefore, your radiation exposure. There are shielding devices, such as the BlocSock - a pouch for your mobile phone that is claimed to reduce SAR (specific absorption rate) levels by 90 per cent, available from emfields.org - on the market, but some of these devices can reduce the signal strength, so reception will be worse. 'The best ones shield the phone from your body more than they shield the phone from outside signals,' says Alasdair Philips. Are mobiles safer on standby? They emit less radiation when on standby (when you're not talking, but the phone is not switched off), but they are still sending out and picking up signals. Several studies, the most recent carried out by the Centre for Reproductive Medicine in Cleveland, U.S., have shown that sperm is damaged or destroyed when men have their phones on standby in their trouser pockets. The study found that sperm cells were affected at just a tenth of the 'safe' SAR threshold. 'Don't have mobiles by your bed if you want a good night's sleep,' says Andrew Goldsworthy. 'The continuous pulse fires up the brain cells and can interfere with sleep.' iPhones are a particular risk, he warns, because they are on permanent standby, even when switched off. They are deactivated and not receiving signals only when in flight mode on an aeroplane. Just like a mobile, cordless phones emit radiation. Also, the base station emits radiation. Studies at the University of Orebro have shown that the long-term risk of brain tumours from the base and phone is similar to that from mobiles. However, the UK Health Protection Agency has said that because the signal doesn't have to travel far to the base unit, the risk is negligible. Heavy use is said to be bad - but what is 'heavy'? The recent Interphone study put heavy use at just 30 minutes a day. After ten or more years of use, this was enough to double the risk of developing a brain tumour. is all equipment using mobile technology harmful? Potentially, though equipment such as electronic smartboards, wireless toys and laptops operate at much lower power and are not used close to the brain. 'But the cumulative effect particularly for a child can be significant,' says Goldsworthy. Will accessing the internet on my mobile phone raise the risks? no, because the handset is further from your head. But if you are downloading a lot of information, such as TV programmes, or sending big files such as high-definition pictures, the phone will be powering up hard. 'So don't use the phone to talk on while it's working to send or receive audio-visual material because the radiation output will be higher,' says Alasdair Philips.